Receiving a diploma should be celebrated, not downplayed! 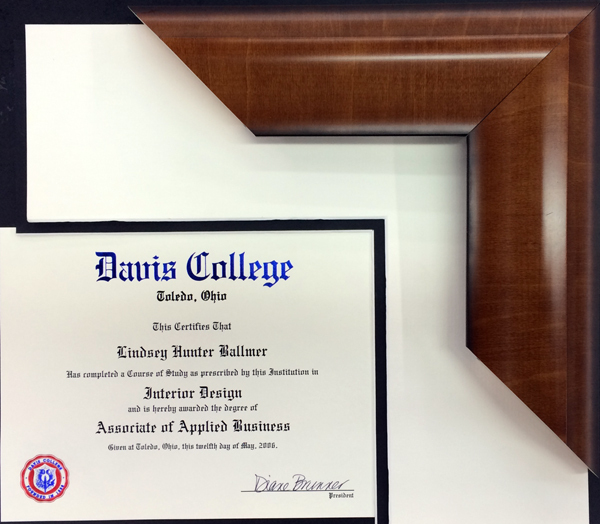 Show off your new credentials by getting your diploma on the wall. Today, on A Good Frame of Mind, we share some tips on how to frame your diploma or certificate. Read more. Lindsey Harrison is the Showroom Manager here at American Frame Corporation. She has an interior design degree and joined our team after working as a designer for 8+ years, although in her free time she still helps clients with smaller projects. Currently Lindsey resides in Maumee, Ohio with her husband and their rescue dog Lucy. In her spare time she enjoys cooking, gardening and spending time with her nieces and nephews. Graduating is an exciting and proud moment in anyone’s lifetime. It is not about money only; it's the return on investment by you, of course time and money investment. So it should be celebrated not only 1 time but for the decades and centuries. Every time whenever you see your diploma, degree or any certificate you should be proud. So keep them new, safe and front of your eyes. Keep them framed with stylish and long lasting wooden frame. Of course with some stylish and attractive frame and Show it to your friends and family members. Great article with ideas for both professional and home office type of frames.